6:50. Wake up. Hit snooze. Get up. 7:20. Out the door to catch the school bus, day 44 of the school year. 7:45. Arrive to school; turn on the computers, pull the chairs down from the tables. It’s tutor time, the thrice-weekly period when teachers bring young secondary students into the library. Alex and I decide to have that group read a page of text and make notecards. Eight students come in and look over textbooks on nuclear power. Just as we’ve settled them down, Gabby walks in with her students, also trying to keep them busy during the unstructured period. I show her our study skills manual. “I used to just study the night before my exams in university, pull an all-nighter, and I was fine,” she laughs. “What about mind-mapping?” I say, distractedly. I never used Study Skills either. “Yeah, mind mapping, I guess that’s good…” She wanders off to look at the geography books. 8:30-9:00. A brief attempt at shelving. 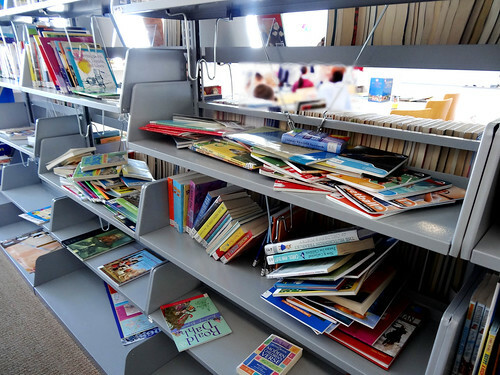 As the picture below might suggest, it takes only one unsupervised moment for students to avidly explore and flatten the shelves. 9:00-9:40. Class. A class of ten-year-olds walk into the library, set their books on the return table, and take some time to settle down; their class assistant helps me get them writing stories for a school competition. “Ms. X, how do I write a story?” Balgul asks, a latecomer to class. “Have you thought of a story?” I ask. “No, I only read Michael Morpugo,” she looks down. I reiterate the difference between a main character (Hero) and a lightning-wielding spandex-wearing world-saving creature (Superhero). Balgul looks much happier and settles down to develop her ideas. I go one by one through twelve children who also have hands anxiously raised, waving for help with finding books or deciding on story ideas. A few moments later, Balgul raises her hand again and asks for a good name for a Italian boy. 9:40-10:15 Break. I go to the lunchroom and sit with my assistant, who’s more of a skilled colleague; she’s just sent off an email to our higher-ups to promote her idea for a new reading review program. I finish my cornflakes and pears, then slip off to work on a storybook of my own, since it’s my break period. I google a few ideas on Kazakh mythology, and get distracted by a list of movies that might interest our students. I add them to our media request list, and prepare the library for student break period. 10:15-11:00. Open period. Thirty children flood into our large library during their break period. Four girls hover by the computer to find answers to their homework; a boy attempts to study, but his friends surround him and lure him away from his textbook. A group of seven-year-old girls wander behind one of the tall shelves to sit down and giggle. I cycle the library several times, helping people to find interesting books and reminding the groups to be quiet. 11:15. The procurement manager comes in. I’ve ordered badges for our student helpers, but the metal ones I wanted are “too expensive.” We negotiate; I agree to a set of cheap aluminum buttons instead. She tells me our delayed order of 1000 new books will arrive in a few weeks; exciting news!!! 11:20. A local teacher’s assistant comes in, thick paperback of Jane Eyre in hand. “It’s too difficult!” Aiyma tells me, setting it on the counter. Our local teaching staff keep trying to go to the adult section to read the classics they *should* read, but can’t finish the hefty 19th-century paperbacks. I suggest a few things from the teen section but Aiyma’s determined on Grownup Classics. She walks out with Hemingway, Doris Lessing, and two pocket-bound editions of Jane Austen. I make a mental note to rename our teen section as young adult. 11:30. An email from the Powers that Be, requesting that I take notes at an upcoming meeting. Of course. 11:31. Young Harry walks in, reminding me that I’m to watch him in the library this period. I suppose it’s my job so that his teacher can get some work done, but also because some kind of allergy prevents him from attending sports with his class. He settles down to read. 11:35. A man comes in with a packet of books and a exit signoff sheet, for a young pupil who’s moving abroad. I return the books in our system and check the girl’s account. All clear. “Where’s the medical center?” the man asks in Russian, looking for the next of ten locations to get signatures. “Up one floor,” I point, “and to the left.” He nods and walks off. 11:45. I send an email to schedule a make-up lesson, because Mr. Henry’s pupils are on a school trip during library time today. I suggest a few times for later this week. 11:50. Pause and refocus. Check the to-do list. The afternoon looks busier, with admin work, possible cover for classes, and unofficial ‘duty’ periods when the pupils browse the library and ask for help. My “assistant” comes in to get some papers and runs out again; in two separate libraries, we rarely see each other. 11:55. Another set of emails to respond to. It seems I’ll be compiling the agenda for that upcoming meeting as well. A software vendor wants to know if we’ll take their training; their competitor wants to know if we’ll buy their LMS (library management system) and take their training instead. I send an email to our financial staff with the quotes, and put off the vendors with polite answers. My assistant still has no phone; I need to order one, and send a reminder on the book trolleys we ordered last year. There’s a meeting for the middle school teachers, but it conflicts with my duties; I’m not sure if I can go. 12:00. A university student intern comes in at lunchtime; we eat together and then I have her shelving books and cataloging some of our new fiction. She’s very kind, calm and reliable. Last week, I tried to help her move some 60 heavy reference books to a distant shelf. “Oh no, you have more important things to do,” she tells me, “I’ll handle it.” Best intern ever. 12:30. I slip away to do some admin work on my laptop; two cleaning ladies scurry out of the staffroom when I (the White Foreigner) arrive. But soon, other teachers wander in and start talking about the school: how to resolve issues? Develop new programs? Effect change? We’re a young organization, but we’ve settled into patterns. And the patterns we’ve settled into provide fodder for endless conversation, change, and re-evaluation. 1:00-1:45. Lunchtime duty, watching the pupils so they can play and their teachers have a break. A boy grabs the computer and several preteen girls read on a sofas. Two boys wrestle on another sofa. Seven and eight-year-olds wander in clumps, searching for the fairy-animal-magic, humour, football, and Where’s Wally books. I push boys out of the room when they start running, reminding them of the rules. 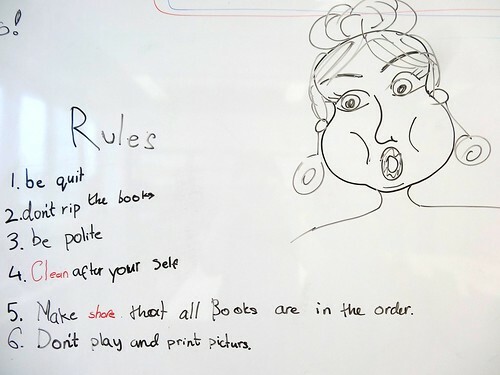 Our girls improvised a list of rules on the library board! While I’m settling the students in for reading, the intern asks for help in cataloging fiction: should St. John be STJ on the spine, or JOH? We decide on the former. I really should check my notes from cataloging class. 1:45-2:20. A class of students comes in for another library lesson on story-writing. We talk about the idea of plot, of having exciting things happen in your story. When I look over their papers, I see a ‘spy mouse,’ a plagiarized Alex Rider, a vague boy named John from America, and a beautiful girl named Olivia who jumps into a book with her cat and fights a girl named Mikkie. There are also people stealing diamonds and taking over the world. 2:25. I run to the other side of the school, to the small library where my assistant reads to the infants. I may need to cover for her, but when I get there, I see she’s returned; I watch for a few moments as she begins reading a story, and then go back to my library, where the intern is leaving for to her university classes. Later, the younger children will each choose their own books – Elmer, Dr. Seuss, Winnie the Witch — and take them carefully back to their classes in plastic envelopes. 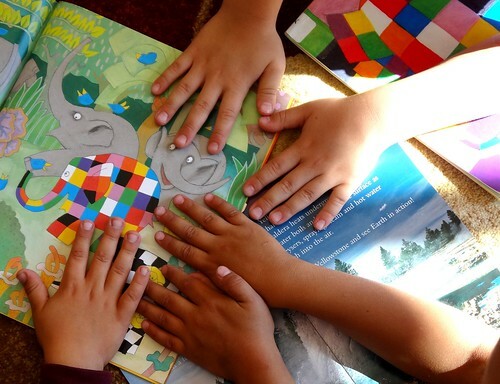 Elmer the elephant is a top fave for young readers. 2:30. Checking my to-do list, I send another set of emails: to distant librarians requesting help for my assistant with some book orders the assistant is compiling, to the stocking manager on the return bins we ordered months ago but which haven’t arrived. The stocking manager comes in with more questions about our order; I check the relevant websites and correct an item code or two. 2:45. I update some signs for the displays. The printers are closely guarded and halfway across the school; I don’t have 20 minutes to walk there and back, so I plan to pick up the flyers on my way in tomorrow. 3:00. “Last minute dot com,” as we say. A teacher comes in to let me know that I’ll be subbing in for her lesson while she’s out tomorrow, on PR duties in the city. After she leaves, I continue cataloging our junior nonfiction. 3:25. A mother comes in; her son’s library book is listed as overdue, but she insists that she put it in his bag and he returned it. I believe her. I look all over the library but can’t find the book, so we agree to both look again. Another boy slips in to return a stack of books, which I process through the system before shelving. 3:30. I sort some new fiction that the intern just catalogued and re-shelve the day’s books, as children bounce along the corridors and come into the library to study. A cleaning girl uses a floor waxer just outside my room every day from 4-5pm: a steady thrum and whine. 3:50-4:10. Two girls come in looking for books, and ask for my help; I take them to the shelves and show them some of the best options. One wants help making a book cover for her story. 4:15. Another girl asks if she can do her homework, and settles in the corner. 4:30. My boss calls; he wants to ask about the school’s awarding of gift certificates for good behavior. He proposes that the library take on the task of procuring and delivering the whole student awards each term (!). 4:45-5:00. I hurry to modify class worksheets for tomorrow’s writing class, before end of day. I’ve got three lessons in a row tomorrow morning, and today’s story-writing worksheet confused some of the students. Many pupils are new to English and their reading levels vary quite widely: some struggle to read a sentence, while others write with eloquence. Every year, we see the gap close and scores improve. But for now, I’m constantly tugging and adjusting: very simple for one class of youngsters, sophisticated for the next. 5:05. I should be packing up, but the builder comes in and wants me to give measurements for a trolley. We glance at a version online and decide to measure the dimensions tomorrow. 5:10. I email one last request for my assistant’s phone, and shut down the computer. 5:15pm. I get to the staff bus just as it’s squealing out of the parking lot. On the bus, Teacher Alex asks if I can teach more Study Skills for his class later this week. 5:50pm. The bus arrives home; I eat a handful of pretzels and some tea. 6:00-6:20. I get some air, and take a walk around the block for groceries. 6:20-6:45. I come in, turn on the computer, and start up on my library coursework for the day. First, some reading and then a quiz for Access to Information. What did the author mean by “access?” What are the principles of cataloging related to book access? I look over my lecture notes and highlighted PDFs before making a guess. 6:45-8:15. I watch the video lectures online for Management of Libraries. It talks about managing people with different personalities and how to perform performance appraisals. This week I have two sets of readings, a final exam, three discussions, and an annotated bibliography to prepare. I’m hoping to push through at least a reading set tonight, but by 8:15, my focus wavers. 8:15-8:45. Coffee, laundry, shower. I sort my iTunes list for a mental break. 10:00pm. “Chai popyom!” A voice calls from the hall. My local housemate has fixed tea and dinner… I sit down with her for a chat and some tea, and she pages through YouTube music videos of babies giggling, showing me her favorites (aah!). 10:40pm. I excuse myself, brush teeth, read a bit longer, and go to sleep. Rinse, repeat! Note: this was posted for the Day in the Life of a Library Student event at Hack Library School. The goal is to describe the life of someone studying for a library degree, which I am. Obviously it’s an anonymized and composite account. Sadly, I can’t post pictures of the sweet kids and talented people I work with, but I hope this gives a realistic impression of what life can be like in a school library and how library school fits with full-time work. This was my lightest class day, and because we’re still setting up a new library, I assume there were more administrative requests than at an established library. At least a quarter of my time is spent on administration. I also hope you can see how school fits in. I imagine if you were sitting at a service desk in a big library, you could get done during the school day, but as a manager that’s hard to justify. If I have time, I do listen to weekly lectures while cataloging picture books, which lets me save my evenings and weekends for more complicated projects. Being a student and running a library is hectic, but rewarding: I get to see how management, teaching, and information theories work out as I’m learning. And when I think of the multiple people I know who are full-time workers, full-time students, and have a spouse and children to care for …well, I’m in awe. I truly can’t understand how they do it! I love this post! Great work. Were you abroad during this time? How did you find a library job while still in school? If it WAS abroad, how did you find your international gig? Super great blog, seriously. I’m going through all of your archives. .. Thanks, Susannah! I was abroad during this time, and did find a library job through lucky circumstances while still in school. I’ve just created a new blog post to address your larger question about how I got there, and it should go up shortly!